street kids, vulnerable children and orphans, destitute and abandoned by poverty and AIDS who live on the streets and the slums, rescuing them from poverty, abuse and hopelessness; Providing them with an environment for growth, hope for the future and an acceptable quality of life by placing them in a nurturing family environment and giving them empowerment for the future. To give each child individually, through knowledge and education, the power to create a successful life for themselves developing welfare as a whole, mind body and spirit. 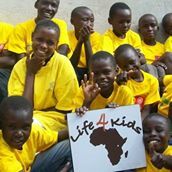 Life4kids is a certified, accredited, licensed and registered charity.